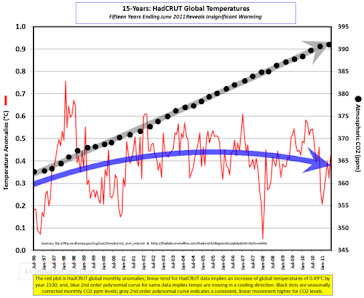 Climate Common Sense: Huffington on warming causing freezing. The fancy footwork of desperate warmists and their tame press can be seen in the latest Huffington post foray into explaining how global warming is causing those pesky huge snowstorms in Europe that aren't supposed to happen in the brave new world of man-made warming. While the terms "climate change" and "global warming" are often used interchangeably, scrutiny of the two phrases reveals a cause-and-effect relationship between the two. Global warming refers to an increase in our planet's average temperature, while climate change refers to the planet's many and varied climactic effects triggered by, among other things, global warming. When hearing the phrase "global warming" people often assume it means that every place on Earth is getting warmer. Not so. In fact, a recent study surmises that the expansion of warming Arctic air will push colder air south, resulting in a cooling of Europe. 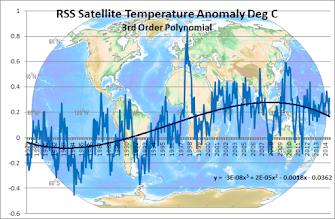 A warming globe causing a cooler Europe? That just might be the case. Just as ironic is the conclusion of the research that inspired today's comic strip: global warming is causing trees in the Arctic to freeze. Reduced snowfall in the Arctic is one of the climactic effects triggered by warmer conditions. With reduced snow cover, the roots of yellow cedars aren't getting the insulation typically provided by snow. This insulation is needed to protect the cedars' shallow roots from freezing, since conditions in the Arctic -- while warming -- are still cold. Question: How should we deal with a global phenomenon that can use warmth to freeze things? Our Question : How should we deal with gullible people who believe codswollop like this? We know crazy too! The men in the white coats are on their way!